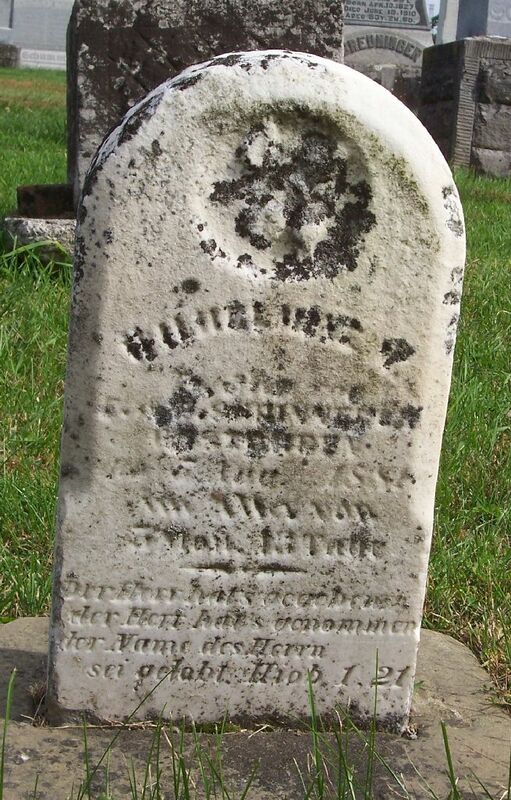 Wilhelmine M. Schinnerer, Zion Lutheran Cemetery, Schumm, Ohio. 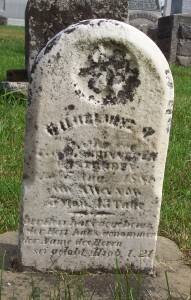 This is the tombstone of Wilhelmine M. Schinnerer, located in row 1 of Zion Lutheran Cemetery, Schumm, Van Wert County, Ohio. The gravestone is inscribed Wilhelmine, daughter of F & E Schinnerer, gestorben [died] 5 August 1881, aged 5 months, 12 days. According to the church records of Zion Lutheran Church, Schumm, Wilhelmine Margaretha Schinnerer was born 22 February 1881. She was baptized 6 March 1881 at the home of her parents, Friedrich Schinnerer and his legal wife Elisabeth, born Schumm. Sponsors at her baptism were Mrs. Wilhelmine Schumm and Margarethe Büchner. Her death and burial are also recorded in Zion’s church records: Wilhelmine Margaretha Schinnerer, little daughter of Mr. Friedrich Schinnerer and his legal wife Elisabeth, was born 22 February 1881, and died 5 August 1881. Her burial was on 6 August 1881 in the parish cemetery. Her funeral text was Job 1:18-22. Wilhelmine was the thirteenth child born to Friedrich Schinnerer and his second wife Elisabeth Schumm. Wilhelmine’s tombstone is next to her brother’s, Christian M. Schinnerer. She died two weeks before he passed away.